최근 아름다움을 추구하는 가치의 확산으로 눈성형은 더 이상 예전처럼 감추고 숨겨야 할 일이 아니다. 특히 동양인의 경우 선천적으로 쌍꺼풀이 없거나 불완전한 경우가 많아 눈성형이 성형수술에서 가장 많은 비중을 차지하고 있다. 또한 그 대상 역시 내국인에서부터 한류 성형을 찾는 외국인까지 더해져 매우 다양해지고 있는 추세이다. 몽고주름으로 불리는 동양인 특유의 눈꺼풀 구조에 대한 연구를 진행하며 앞트임과 쌍꺼풀 전문병원으로 자리매김하고 있는 강남역 트임성형외과 권봉식 원장은 꾸준히 이 분야의 연구논문과 수술실적을 쌓아가며 한류성형에 기여하고 있다. 지금은 보편화된 앞트임 수술이 과거에는 몽고주름에 대한 학술적 이해 부족과 이에 따른 앞트임 수술법의 한계로 인해 수술 과정에 어려운 점이 많았다. 권 원장은 동양인의 눈꺼풀 특성, 앞트임과 쌍꺼풀 분야에 관련된 SCI 논문들을 발표한 바 있다. 개인병원을 운영하면서 SCI 논문을 쓰는 것이 쉬운 일이 아니나, 진료와 연구를 병행하며 논문들을 발표함으로써 이 분야에 대한 전문성을 인정받을 수 있었다. 권 원장은 "오직 눈성형 분야에만 집중한 결과 실질적인 연구 성과와 좋은 수술결과를 낼 수 있었던 같다. "라고 말한다. 특히 권 원장은 '몽고주름의 재고찰 : 눈꺼풀의 진화이론과 되돌림 개념의 동양인 앞트임, 쌍꺼풀 눈성형 수술방법(Reconsideration of the Epicanthus : Evolution of the Eyelid and Devolutional Concept of Asian Blepharoplasty, 미국 성형외과학술지 게재)'이라는 논문을 발표하였다. 이는 권 원장의 이전 논문과 영문 홈페이지에 게재한 학술적 내용을 인정한 미국 성형외과학술지가 앞트임 수술에 대한 지정저자로 선정하여 논문을 게재한 것이다. 해당 논문의 내용은 ‘동양인 눈꺼풀의 진화이론’과 이에 근거해 권 원장이 개발한 '데볼루션 기법의 앞트임과 쌍꺼풀수술법‘에 대한 것이다. 동양인의 눈시울을 덮는 눈꺼풀 덧살, 흔히 몽고주름이라 불리는 부위는 1830년대 독일 폰 아몬 박사의 '동양인에게 나타나는 일종의 기형'이라는 학문적 가설이 정확히 규명되지 못한 채 200여 년의 시간이 흐르는 동안 관성적으로 받아들여지고 있었다. 그러나 권 원장의 연구 결과 “몽고주름은 한랭한 기후에 적응하기 위해 쌍꺼풀이 상실되는 과정에서 나타난 동양인 눈꺼풀의 진화생물학적 변형이다"라고 새로운 학술적 결론을 내렸다. 권 원장은 논문의 새로운 눈꺼풀 진화이론에서 몽고주름이 선천성 기형이라는 고정관념에서 벗어나 진화생물학적 형성기전과 해부학적 특성을 제시하였다. 또한 동양인의 쌍꺼풀 상실과 연관된 몽고주름의 해부학적 실체에 대한 이해를 바탕으로 앞트임과 쌍꺼풀 수술의 개념을 새롭게 정리하였다. 쌍꺼풀 수술에서 몽고주름이 중요한 위치를 차지하는 이유는 동양인의 경우 몽고주름에 대한 앞트임 수술과 쌍꺼풀 수술을 병행해야만 사실상 완전한 눈성형이 가능하기 때문이다. 권 원장 스스로 "쌍꺼풀 수술 과정에서 유사한 시술을 해도 어떤 사람은 좋은 결과를 얻고 어떤 사람은 좋지 않은 결과를 얻게 되는데 그 이유에 대한 고민이 지금의 연구결과를 낳았다"고 밝히고 있다. 진화이론으로 앞트임 수술과 쌍꺼풀 수술의 밀접한 상관관계에 대한 명확한 해부학적 설명이 가능하였으므로 복합수술의 개념을 도입하여 쌍꺼풀 수술결과의 일관된 완성도를 얻게 되었다고 한다. 데볼루션(devolution:반진화) 기법의 앞트임과 쌍꺼풀 복합수술이 권원장이 제시한 구조적으로 완전한 동양인 쌍꺼풀 수술의 개념이다. 권 원장은 앞트임 수술 자체에 대한 인식이 미비했던 10여 년 전부터 온오프라인에서 몽고주름, 앞트임과 쌍꺼풀 수술에 대한 새로운 의료 정보를 직접 제공하고 있다. 권 원장은 “과거에는 앞트임 수술에 대한 부정적 여론이 있었던 것이 사실이나 이는 앞트임 수술의 결과가 만족스럽지 못하였고 흉터가 많이 남았었기 때문이다. 몽고주름의 학술적 이해부족으로 인해 앞트임과 쌍꺼풀 수술은 별개의 것으로 여겼으며 앞트임 수술이란 눈머리 아래쪽의 피부주름을 제거하는 것 정도로만 인식되기도 하였다. 하지만 몽고주름을 개선하는 과정이야말로 쌍꺼풀 수술의 완성도를 위한 열쇠라고 할 수 있으며, 이러한 복합 수술을 통해 눈꺼풀 조건에 관계없이 항상 자연스럽고 매력적인 쌍꺼풀을 구현할 수 있다”라고 말한다. 권 원장은 진화이론이 적용된 데볼루션 기법의 앞트임수술에 대하여 ‘매직앞트임’이라는 서비스표를 특허청에 등록하고, 이를 과거의 몽고주름 기형이론에 근거한 앞트임수술법들과 구분 짓고 있다. 트임성형외과는 내국인들만이 아니라 여러 외국인들이 즐겨 찾는 성형외과 중 하나이다. 눈 성형 전문의로서 외국인들에게 높은 인지도를 가지고 있는 트임성형외과 권봉식 원장은 의학영문사이트 epicanthoplasty.com (epicanthoplasty:앞트임)을 운영하며 전 세계 동양인들에게 동양인 눈꺼풀의 해부학적 특성과 눈성형에 대한 최신 의학정보를 제공하고 있다. 권 원장은 많은 고객을 수술하기보다는 고객 한분 한분의 수술 완성도와 결과를 중요시 한다. 외국인들의 성형토론 영문사이트들에는 권 원장에게 수술 받은 환자들이 직접 올린 수백 건의 영문 수술후기가 10여 년간 누적되어 있고 이로 인해 외국환자들 사이에서 가장 많이 언급되는 눈성형 전문의 중 하나가 권 원장이라고 한다. 진료의 질을 우선으로 하고 의학적 원칙에 따른 정직한 진료로 트임성형외과는 한류 성형 1세대로서 오랫동안 이미지 제고에 일조하고 있다. 권 원장은 "쌍꺼풀 수술이 보편적으로 시술되는 지금도 적절하지 못한 시술로 인한 부작용 사례가 적지 않다. 특히 외국에서 수술한 경우 몽고주름에 대한 임상적 고려 없이 눈성형이 이루어져 결과가 부자연스러운 경우가 매우 많다. 이는 동양인의 눈꺼풀 해부학에 대한 정확한 이해가 뒷받침되지 못해 생긴 일이다. 뒤늦게 우리병원에서 재수술을 통해 만족스러운 결과를 얻고 감사 인사를 전하는 외국인 환자들의 환한 미소에 보람을 느낀다. 앞으로도 동양인 환자들이 의학적으로 더욱 완전한 눈꺼풀 수술을 받을 수 있도록 눈성형 분야에 대한 학술연구 활동을 계속해 나갈 것"이라고 한다. 대한민국을 대표하는 눈성형 전문가, 눈성형재수술 전문가로서 대한민국의 행복지수를 높이고 있는 눈성형 명의인 권봉식 원장의 행보는 앞으로도 지속될 예정이다. Kwon's SCI thesis suggests a new paradigm for Asian blepharoplasty. Kwon's SCI thesis realizes a consistent and satisactory result of double eyelid surgery. "Mongolian fold is a result of evolution"
Many plastic surgeons had difficulty to deal with eye line plastic surgery (epicanthoplasty) due to a lack of understanding about Mongolian fold. Kwon published SCI thesis 'Reconsideration of the Epicanthus'. It is not easy to write SCI thesis but he ardently carried out treatment and research at the same time and was credited for his speciality in the field. Kwon says "I could have good research and operative results because I only focused on one field." The SCI thesis 'Reconsideration of the Epicanthus : Evolution of the Eyelid and Devolutional Concept of Asian Blepharoplasty' was published on a US plastic surgery journal. 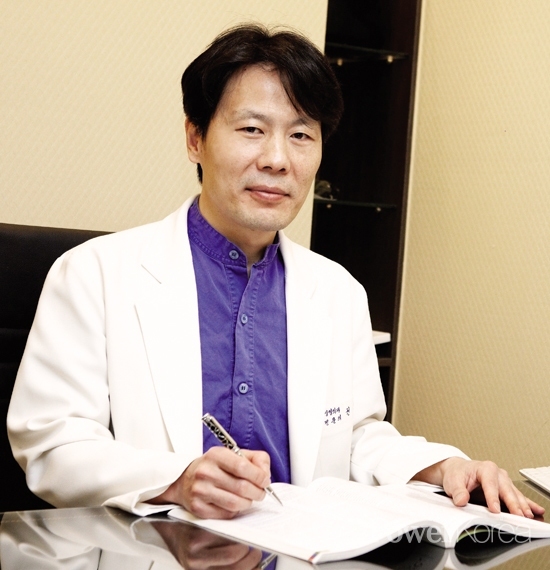 The journal appointed Kwon as an eligible specialist of blepharoplasty for the article. Most Asians have Mongolian fold (epicanthus). Regretfully, Dr. Von Ammon formulated a theory in 1831 that the epicanthal fold is an congenital abnormality occurring to Asians which had been widely accepted for over 200 years. Thankfully, the Korean Dr. Kwon Bong-sik published the thesis suggesting that the fold was a natural bio-evolutional transformation of the eyelids to acclimate themselves to the cold climate in the region. But Kwon's achievement did not stop here. He also suggested a new principles for Asian eyelid surgery based on his evolution theory. Magic Epicanthoplasty based on Devolutional Method enables a complete form of eyelid surgery in Asian. "Rearrangement of the structure of Mongolian fold is the core part for Asian double eyelid surgery"
For consistent result of Asian double eyelid surgery, epicanthoplasty and double eyelid surgery should be carried out together to improve the structure of Mongolian fold according to Kwon. He explains "This is the reason why one gets a better result than other because the surgeon for the latter case might not take into account the both elements." Kwon suggests his unique Magic Epicanthoplasty based on Devolutional Method as the key for the perfect double eyelid surgery for Asians. He has been providing and updating the related medical information on Mongolian fold and its surgery since 2007. Kwon says "Back then, people had negative opinions about epicanthoplasty because the surgery left a scar and was not effective. Lack of understanding about the relationshaip between epicanthoplasty and double eyelid surgery was another negative factor. But the process of proper improving the epicanthal fold through combined surgeries is the key to have a consistent and perfect result of double eyelid over just removing wrinkles." Kwon obtained a patent for his Magic Epicanthoplasty and differentiated this unique method from many previous methods which are based on the Von Ammon's anomaly theory. Teuim Aesthetic Plastic Surgical Clinic is not only famous among Koreans but many foreigners thanks to Kwon's innovation in the field. Kwon runs his own web site in English (epicanthoplasty.com) to provide the right and the latest information about the surgery for all Asians in the world. Kwon values more of the perfection of the surgery than the number of surgery. This of his principle has been well praised by his foreign patients who have left excellent feedback and satisfaction on the web site for the last 10 years. As a result, Teuim Aesthetic Plastic Surgical Clinic has become not only one of the most sought-after clinics in the field especially among foreign patients but also it has significantly contributed to spreading the excellence of the Korean plastic surgery to the world. Kwon says "People take double eyelid surgery quite naturally nowadays. But the side effect is still being reported especially when one had a eyelid surgery in a foreign country as many of foreign doctors don't have proper understanding about the anatomy of Asian. I feel really worth whenever my foreign patients show a gratitude to me for a perfect and satisfactory surgery. To return back the gratitude, I will keep continuing my R&D based on evolutionary biology and genetic medicine in order to introduce more innovative and revolutionary methods."